Posted on April 21, 2018 by Patti at AHA! This theme has been taking over my night time dreams for the past several weeks. This alone has made me think it’s an important thing to pass along. The words “choose love” echoes in a cavernous area, resounding all around me. So visceral, I feel the vibration of the sound bouncing off my body before I hear its fading into the distance. The words “choose love” sound in my head as I see an angry faced, teenage bully step up to a little 9 year old boy pulling his 6 year old sister in a wagon tied behind his bike. “Choose love” I whisper anticipating something different than the obvious. The words “choose love” flash across the television screen that shows me the state of the world news…bombs, crashes, shootings, ice caps melting, a trash corral in the ocean, bunches of dead fish on a beach and dead birds on a suburban street. The words “choose love” slip out of my own mouth as I see further into these scenarios, the strings of possibilities. Most are bad on the surface but when you look deeper, further along the string the possibilities split and morph. There is good there, somewhere, there is good. Most people stay on the surface and react to all the surface crap, some even refusing to see there are always more points of view than the one they see. Choose love, please. A kinder and gentler way of opening oneself up to the extended possibilities. Because the way we see and react to the world at large from our neighborhoods to the news we see online or on television affects us first. Secondly our reactions reflect how we wish to treat the world we live in and in an echo, how our world reacts to our thoughts and actions. What affects you in your everyday life and how you live it? Choose love first. Whether you ‘feel’ it or not. React through that choice next and forward from there. This can lead to a whole different life for yourself. 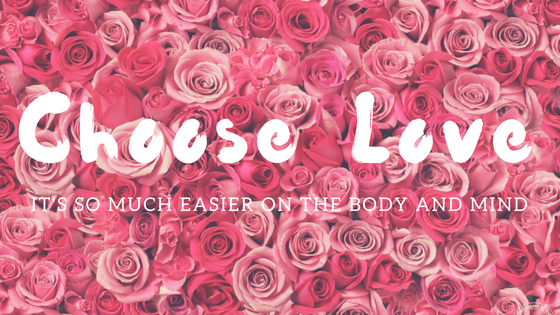 Leave ego and judgement out of your reaction and it’s easy….to choose love. Subscribe to our email newsletter to receive first looks, coupon codes and special giveaways!